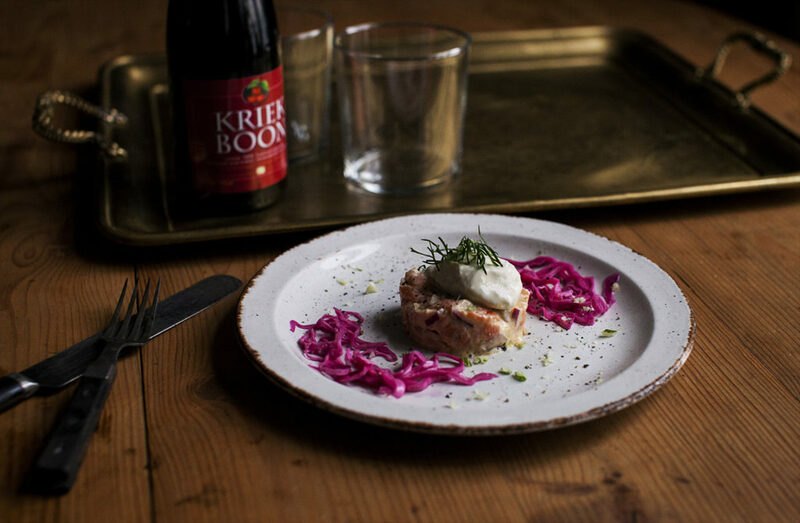 Norwegian salmon is some of the best in the world, and it is our biggest export to the rest of the world. But farm-raised salmon is one thing and wild salmon is a whole other thing. Even here in Norway, a lot of the farmed salmon is filled with lice, and because of the food they eat and the water they swim in, they have a lot more contaminants in them. So before eating a whole lot of salmon, it can be wise to read up a bit on salmon farming, and the best thing overall is of course to get wild salmon, which is also much tastier. Thankfully I have a family that loves to go fishing and that provides me with a lot of good fish, like the smoked salmon I used in this recipe. As anyone who has eaten sushi knows, raw salmon is awesome, and therefore good for a tartare. 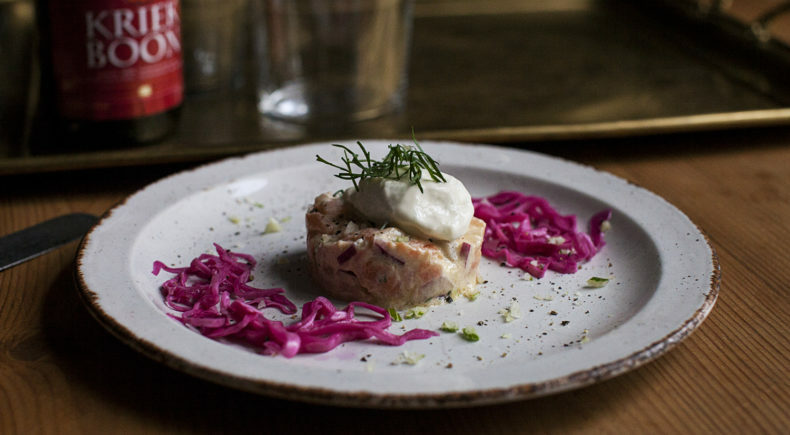 In this recipe, I will be mixing raw salmon loin and smoked salmon. Step 1 Start with the red cabbage. This can be done days or weeks in advance. I love this stuff, so I always keep a jar in the fridge. Step 2 Mix vinegar, water, sugar, salt, and pepper, until the sugar has dissolved. Step 3 Finely cut the cabbage with a knife or mandolin and put in a mason jar or similar container. Step 4 Pour over the liquid and store for a minimum of two hours, it is best after a few days. Step 5 For the Ice Cream: Prechill your ice cream machine, if you have one. Step 6 Roughly chop the fennel, and put half of the fennel in a blender. Process for a minute. Place in a piece of kitchen paper or muslin and squeeze out the juice. Don’t throw away anything. Step 7 Place the rest of the fennel in the blender and add a splash of milk this time. Process until smooth and do the same thing as the previous steps. Here you can throw away the fennel after squeezing. Step 8 Place the egg, sugar and the fennel juice (the one without the milk) in a bowl and mix with an electric mixer until fluffy. Step 9 Heat the cream until just before boiling, then add slowly with the fennel milk to the bowl with the mixer running. Step 10 Place mix in a saucepan and heat while stirring until it has thickened, about 5 minutes. Put the mix in an ice bath or in the fridge to cool. Step 11 Add the mix to your ice cream machine, after it has churned for a bit, add the fennel bits (save a spoonful or two for final plating) left from making the juice. Step 12 For the Salmon Tartare: Mix the red onions and lemon juice in a bowl, and leave for 10 minutes. Step 13 Mix the salmon, chopped dill, mustard, crème fraîche, olive oil, salt, pepper and the onions and lemon juice. Step 14 Plate all the elements with a few twigs of dill and the leftover blended fennel.